There’s part of me that still hasn’t gotten over the fact that Koryta stopped writing Lincoln Perry novels, enough so, that I’ve only read 2 of his stand-alones. But I was intrigued by the idea that he was starting another series featuring a P. I. It took about 3 seconds of reading the Publisher’s Description to see that this was going to be pretty different than any other P. I. series around. This book centers on two men haunted by their pasts and a pair of deaths that happened on the same date, a few years apart — coincidence? That depends who you ask. Our P. I. is Mark Novak, who works for a group of lawyers trying to clear men on death row. Before she was killed, his wife worked for them, too. She was killed during an investigation, after a fight with Mark. No one has come close to catching her killer. It’s understating things to say that before Mark met Lauren, his life was a mess, and she helped him get things together. Without her, things are starting to fall apart for him. Ridley Barnes never really fit in anywhere or with anyone in the small Indiana town of Garrison, except the caves nearby. Something about the caves calmed him, centered him, gave him a purpose — he knew those caves better than anyone alive. So when a teenage girl gets lost in them, he’s the perfect candidate to lead the search. And then, when he recovers her body, but can’t account for his time during the search, or really remember where he found her, or where he’d been at all — he suddenly becomes the top suspect in her murder. There wasn’t enough evidence to convict or even arrest him, but for some small towns that kind of thing is just a formality. He was convicted almost immediately in the court of public opinion, and has been even more ostracized than before. More than a decade later, Ridley just wants to know what happened — if he killed the girl, he’s willing to do the time. If he didn’t, he’d like to have his name cleared. This is not the type of thing that Innocence, Inc. does. They take on convicted murderers clients, not suspects. Especially not suspects in very cold cases that will never go to trial. But Mark’s boss sends him to do a preliminary investigation anyway, mostly to keep him busy. Mark isn’t exactly welcomed to Garrison with open arms, people just assuming he’s there to clear Ridley, and not quite believing him when he says that he isn’t. Mark commits a few missteps right out of the gate, which turn public opinion against him even more. But something has flipped a switch in his brain and he’s not going to let go until he gets some resolution for the girl, clears his name from the problems he’s caused, and demonstrated to his boss that he can be trusted still/again. Not necessarily in that order. That’s a very sketchy overview of the set up. I don’t think I’ve read anything quite like that before. If you were to draw the plot as a map, it’d look like some deranged roller coaster — tight corners, backtracks, loops, big dives into darkness. Unlike an actual roller coaster, I was able to get through this without losing everything I’d eaten since February. 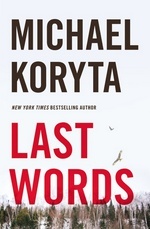 Koryta tells this story with his typical skill, you can tell that he’s built Mark Novak to last a few novels. There’s more of his story that needs to be told than is here, and the character can be used in different settings. Unlike just about everyone in last years’ Those Who Wish Me Dead — which I thought was great — I don’t think there was a single character in that novel that I could see being interested in for another novel. Ridley is almost as complex, and you want him to get the answers he needs just to get a little peace (most of the time — there’s a time or two where you don’t mind him suffering). Garrison, IN is pretty much every small town in mystery/thriller fiction, and its citizens are pretty much stock characters. On the whole, neither the town nor the people feel that way. Which is entirely due to Koryta’s skill and Mark’s voice. And then there’s the cave, or caverns — I’m not familiar enough with the geology to nail the distinctives between the two. There’s a strong sense of place, of foreboding, of danger to it. Especially in Ridley’s mind, the cave is almost a Byronic character — dark, mysterious, dangerous, yet attractive. Yes, there was a time or two I was glad to be reading about the cave in a very wide and open room. Oh, sure, and it’s a real handy metaphor for the depths of the human mind, psyche, soul, etc. This is a very well constructed mystery novel, the writing is excellent, the characters are keepers, you can almost feel the winter air — really, there’s very little to not rave about with this. It’s pretty clear what book 2 holds, but I’m really not at all sure what a third would bring. But I’m eager to find out.